Fred Magdoff is professor emeritus of plant and soil science at the University of Vermont. John Bellamy Foster is editor of Monthly Review and professor of sociology at University of Oregon. They are coauthors of The Great Financial Crisis (2009) and What Every Environmentalist Needs to Know About Capitalism (2011)—both published by Monthly Review Press. The authors would like to thank R. Jamil Jonna for his help with this article. This was in accordance with the argument advanced in Karl Marx’s Capital. Since the vast majority of individuals in the capitalist system are divorced from the means of production they have no other way to survive but to sell their labor power to those who own these means, that is, the members of the capitalist class. The owner-capitalists are the legal recipients of all the value-added that is socially produced by the labor in their employ. Out of this the owners pay the wages of the workers, while retaining for themselves the residual or surplus value generated by the social process of production. This surplus then becomes the basis for the further accumulation of capital, leading to the augmentation of the means of production owned by the capitalist class. The result is a strong tendency to the polarization of income and wealth in society. The more the social productivity of labor grows the more it serves to promote the wealth and power of private capital, while at the same time increasing the relative poverty and economic dependency of the workers. A crucial element in this process is what Marx called “the reserve army of labor” or “relative surplus population.” With the exception of extraordinary situations such as major wars that mobilize millions of people or epoch-making expansions resulting from special historical factors, the capitalist economic system does not produce enough jobs for everyone. Although there are certainly better times, during upturns, and worse times, during downturns, there are almost always large numbers of people who need jobs but who cannot easily find employment. Many of the jobs that are created pay low wages—below those necessary to afford basic needs like decent housing and a good diet. Workers in the reserve army are characterized by “extremely irregular employment.”3 They are easily fired if the economy slows a bit, but ready for hiring when the economy picks up. This group of workers includes all those that have given up looking for jobs in weak labor markets, along with those working part-time but wanting full-time employment—on top of those officially designated as unemployed. It also includes the chronically impoverished.4 It is the existence of this reserve army of “surplus” workers that makes it difficult for those in the active labor army to increase their wages or improve their working conditions without a united effort involving labor union struggles. There have of course been periods of time when strong union movements or pro-labor political parties (especially in Europe) have allowed for improved working conditions and higher wages. Although capital gave nothing away without a struggle by workers, the Cold War added a new dimension. Governments in the wealthy countries at the center of the capitalist world economy that needed to ensure the support of their workers as part of a Cold War compact were a bit more likely to take labor’s wishes into account. This was later reversed. While there have been ups and downs since the late 1970s the conditions of labor have generally deteriorated over the period as a whole. Workers in the United States are currently under extreme pressure—unlike any other period since the Great Depression of the 1930s. Conditions in today’s phase of monopoly-finance capital, dominated by neoliberal policy, are the culmination of a long process of lopsided class war—with capital continually gaining strength in its battle to limit and control labor. During this period, and especially since the beginning of the Great Recession, capital has squeezed labor ever harder—doing more with less, as they say—in order to increase profits. At the same time, the economy has been characterized by deepening stagnation—with real GDP growth declining from around 4 percent a year in the 1950s and ‘60s to around 3 percent a year in the 1970s–1990s to 1.8 percent a year for the last decade (2002–2012). Financialization, arising in response to deepening stagnation from the 1970s to the present, has served to preserve and promote wealth at the top and temporarily to lessen stagnation in the economy as a whole—but at the cost of even greater economic instability over the long run. As economic growth has slowed so has net job creation—from around a 2 percent increase per annum in the 1970s and ‘80s to less than 0.3 percent per year for the last decade, 2002–2012 (and 1 percent a year over the last two decades).6 The economic trend toward greater stagnation and capital’s response to it—including the turn to finance, outsourcing and offshoring, and increasing pressure on workers and their organizations—have combined to undermine the overall condition of the U.S working class. The various bilateral and multilateral trade agreements that are now in effect—such as NAFTA, CAFTA, and the WTO—did not spring up out of thin air in response to a new ruling-class ideology. Rather they are the result of a continuing process in which imperial capital has created a post-Second World War, post-colonial economic structure favorable to its interests. Designed to give maximum flexibility to capital, it has ensured a more docile workforce, rightfully afraid that jobs could be “offshored” to countries with lower wages and other costs of production. An earlier trend that happened within the United States, in which factories from the Northeast (textiles) and Midwest (automobiles) moved to the South, now occurs on an international scale. What is referred to in financial circles as “the global labor arbitrage,” or the increasing shift of multinational-corporate production to the global South in order to exploit workers with the lowest worldwide unit labor costs, was made possible through an international political process, spurred by U.S. imperialism, that opened up the periphery of the world system to unrestricted flows of global capital.15 This meant a two-pronged attack on labor and its political power in both the global South and in the global North—of which the 1994 North American Free Trade Agreement (NAFTA) was to emerge as emblematic. There were numerous indications of the decline of organized labor’s fortunes and power relative to capital in the United States from the 1970s to the onset of the Great Recession in late 2007. For example, there was a decreased percentage of the workforce that was unionized, a decreased esteem in which union workers were viewed by many in society, and a lower frequency of major strikes (only a few per year compared to literally hundreds per year in the 1950–1980 period). There is no doubt that the increased surrender of workers in the face of the assault by capital was due to the fact that they were understandably concerned that the bosses would either hire replacement workers or close the facility and move the jobs to another location in the United States or to another country. Given the pre-existing problems and negative trends for labor, the Great Recession (officially considered to have run from December 2007–June 2009) and the deep stagnation that followed have made the situation of workers in the United States ever more precarious. As far as workers are concerned the Great Recession has turned into the Great Stagnation, the slowest “recovery” from a downturn in the post-Second World War era. Wages have stagnated, with the real median family income in 2012 below that of 1996, and the economy has yet to produce enough activity to regain all the jobs lost during the Recession. The effects of the Great Recession and the Great Stagnation have thus only served to worsen the conditions associated with the loss of worker power under the prolonged attack on labor. 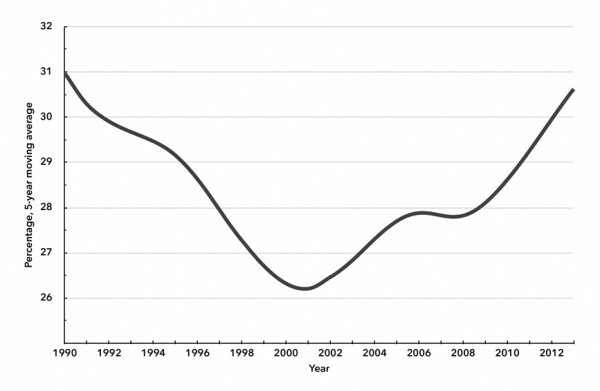 There are a number of important trends occurring simultaneously in this respect—(1) the decline of employment, (2) erosion of health associated with job loss, (3) wage stagnation, (4) growth of the working poor, (5) increased exploitation of labor on the job, and (6) the drop in the labor share of income. It is important to discuss these separately, but also in relation to each other, in order to get a better grasp of the extent of the problems. 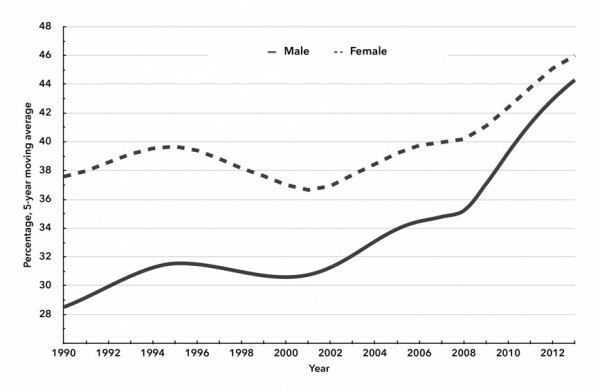 As shown in Chart 1 (using five-year moving averages) the percentage of the total male civilian non-institutional population, ages twenty-five to fifty-four—constituting prime working ages—lacking employment of any kind has trended upward from 5 percent in 1968 to 18 percent in 2013. Sources: U. S. Bureau of Labor Statistics (BLS), “Employment Level” and “Population Level,” series LNU02000061 and LNU00000061, http://data.bls.gov. Although women’s labor force participation rose steadily over the last decades of the twentieth century, and hence the real jobless rate for women declined for decades, this trend has now reversed. For women ages twenty-five to fifty-four in the 1990–2013 period (shown in Chart 2 with five-year moving averages) the real-jobless-rate trend takes the form of a sharp V-curve, dramatically reversing in the early 2000s, and increasing to over 30 percent in 2013. As compared to two decades ago many more of these jobless women are in a position where they need jobs simply to maintain themselves and their families. Sources: BLS, “Employment Level” and “Population Level,” series LNU02000062 and LNU00000062. Also see note to Chart 1. For younger workers, the picture is even worse. Chart 3 shows the trends in the real jobless rates for men and for women ages eighteen to twenty-four since 1990. These rates rose to 44 percent for men in 2013 and 46 percent for women. Increasingly young people are being driven out of the job market altogether. They are finding themselves in a particularly untenable situation with it being so difficult even to enter the ranks of the employed. About 15 percent of people aged sixteen to twenty-four—some 6 million of them—are neither working nor in school.18 And their future prospects are questionable given the findings of studies showing that once workers get behind their cohort in the job market they rarely catch up. Sources: BLS, “Employment Level” and “Population Level,” series LNU02000152, LNU02000317, LNU02024885, LNU02024886, LNU00024886, LNU00000317, LNU00000061, LNU00000152 and LNU00024885 Also see note to Chart 1. At the depths of the Great Recession, some 8.6 million jobs had been lost. 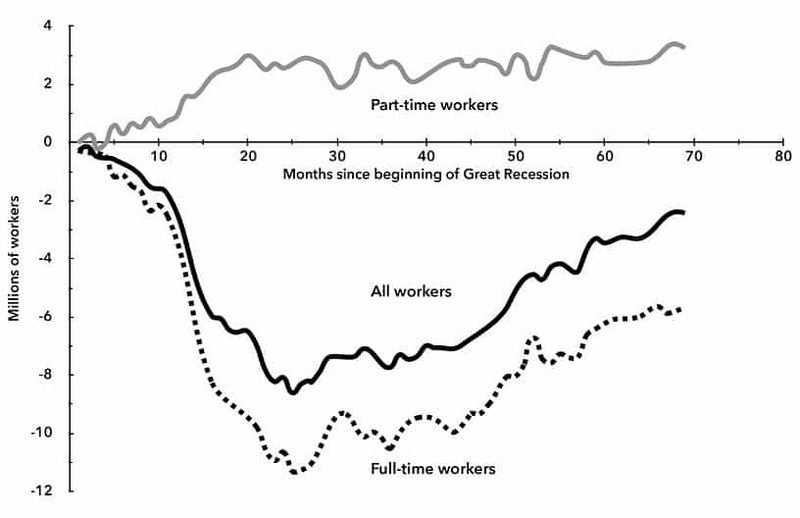 However, the situation was actually even more serious than that—since even though there were more than 11 million full-time jobs lost, the increase in part-time employment during the Recession made the job-loss situation appear less severe than it was (Chart 4). At the time of this writing, there are still about 2 million fewer employed workers today, four years after the official end of the Great Recession, than were employed before the recession began. But there are some 5.5 million fewer full-time jobs. At the same time that millions of jobs lost in the Great Recession have still not been regained, the population has also been growing—so many more jobs are now needed than before. In 2007–2012 the number of people ages twenty-five to fifty-four, most of whom presumably need jobs, increased by about 6 million. Source: St. Louis Federal Reserve Fred Database, series LNS12500000 and LNS12600000. The precarious employment conditions affecting workers in the United States are even more apparent if we look at the data derived from what the Bureau of Labor Statistics (BLS) refers to as “alternative measures of unemployment,” encompassing part-time workers desiring full-time work and workers who are discouraged, having given up looking for work—along with those who are otherwise “marginally attached.” Such data gets closer to what Marx meant when he wrote of the reserve army of labor. 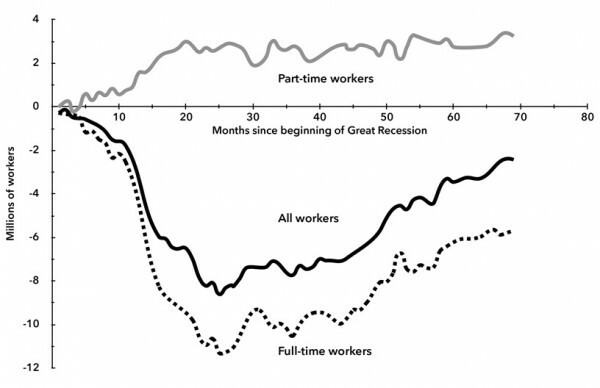 The increase in discouraged workers began even before the onset of the Great Recession, going back to the previous recession (2001) following the bursting of the dotcom bubble. The percent of the population that is actually employed or looking for work (the labor force participation rate) dropped from 67.3 percent in 2000 to 63.2 percent in September of 2013. Although the population is aging and increasing numbers are retiring (the baby boomers are reaching retirement age), even when looking at only those considered to be in the prime working ages of twenty-five to fifty-four years old, participation rates dropped from 84.6 percent in 1999 to 80.4 percent in September 2013. Although these percentage-point changes may seem small, the implication is that there are nearly 10 million extra people, including 1.5 million in the twenty-five to fifty-four year old age group, who would have been in the labor force if participation rates had not declined. The BLS’s estimate of those “marginally attached” to the labor force plus people working part-time but wanting full-time work is approximately another 9 million people. Thus there are over 20 million people who are “officially” unemployed, or “marginally attached,” or working part-time but wanting full-time jobs (Table 1). But the BLS counts in its alternative measurements of unemployment merely 1.2 million of those not in the labor force—including among the marginally attached only those who looked for work in the last year (but not during the last four weeks). But what about people who gave up looking for work more than a year ago or, if young, have never looked for work because they feel that they will not find a job? One way to get at this issue is to use the estimate (in Table 1) of the number of “missing workers” that would have been in the labor force if the labor force participation rate had remained at its 2000 level.22 If they are added in (minus those already counted by the BLS in their estimate of un- and underemployment), the total number of jobs needed to reach full employment is close to 30 million (Table 1). To put this into perspective, the total private-sector employment (in September 2013) was 113 million. Thus the jobs needed for full employment by this count represent more than a quarter again as many as the private sector currently provides. In cities across the country, workers stand on corners, line up in alleys or wait in a neon-lighted beauty salon for rickety vans to whisk them off to warehouses miles away. Workers say the 15-passenger vans often carry 22 people. They sit on the wheel wells, in the trunk space or on milk crates or paint buckets. Female workers complain that they are forced to sit on the laps of strangers. Some workers must lie on the floor, other passengers’ feet on top of them. The people here are not day laborers looking for an odd job from a passing contractor. They load the trucks and stock the shelves for some of the U.S.’s largest companies—Walmart, Nike, PepsiCo’s Frito-Lay division—but they are not paid by them; instead they work for temp ­agencies. On June 7, 2013 the Labor Department reported that the nation had more temp workers than ever before: 2.7 million. Almost one-fifth of the total job growth since the recession has been in the temp sector. One list of the biggest U.S. employers placed Kelly Services second only to Walmart. About 16–18 million workers losing their jobs each year is about “normal” (this rose to 25 million at height of the Great Recession)—though most quickly find work. This number does not include those that quit or leave for other reasons such as retirement. The private sector, as previously noted, has only about 113 million workers altogether. Thus, although those precariously attached to the economy (essentially the reserve army) lose their jobs more frequently than others, over a period of a few years a high percentage of all workers either have experienced unemployment or know someone who has. Thus while profits of the fast food industry and giant companies that use mainly low-wage labor like Walmart are definitely private, a portion of their labor costs—the difference between what they pay and what a person needs to survive in this country—have been socialized. In Marx’s terms, private companies are not paying the full value of labor power (the cost of reproduction of the worker) but are requiring society to pick up the tab through a welfare system that is at the same time punitive and demoralizing. Given the long-term pressure on labor generated by the one-sided class warfare from above, the result has been that many in the United States—both working and nonworking families—are simply unable to make ends meet. As discussed previously, there are large monetary costs for social programs to support workers earning inadequate incomes to support their families. But the uncounted costs of poverty in terms of quality of human lives, and health and life expectancy, are enormous. The sheer number of poor people in the United States, and the number that are near poverty—perhaps a single paycheck away from losing housing or from hunger—is truly staggering. About 15 percent of the population, 46 million people, live below the poverty level, which is around $14,000 for a two-person household and $23,492 for a four-person household.35 Twenty million of those living in poverty (close to half) are relying on an income that is less than 50 percent of the poverty level—$7,000 for a two-person household and $12,000 for a family of four. Over 100 million people (one-third of the U.S. population) are existing below twice the poverty income, close to $47,000 for a family of four. The Class War: Is it Necessarily One-Sided? In the present period of monopoly-finance capital the U.S. economy has been increasingly prone to stagnation. This is reflected in stunted growth rates, coupled with rising unemployment, underemployment, and unutilized productive capacity. Similar conditions exist throughout the triad of the United States/Canada, Europe, and Japan. With the increased financialization of the economy the fates of the haves and the have-nots have more and more diverged. For a large portion of the working class, these are the worst of times. However, for the 1 percent in general, the 0.1 percent more specifically, and especially for the exclusive 0.01 percent at the very top of society, these are the best of times. And it has not been too bad for those near the upper echelons, even somewhat below the top 1 percent. Unable to prevent the deepening stagnation of the monopoly capitalist economy, the wealthy were nonetheless able to transform it to meet their own “needs” by financializing the system and their own wealth, and diverting more and more of the monetary flows of the economy, including state-sector funds, into their own deep pockets. The enormous expansion of the reserve army of labor over the last thirty years, which has weakened the working class and undermined its traditional organizations such as labor unions, coupled with an organized, one-sided class war from above, has resulted in a massive and continuing redistribution of income and wealth to the top of the pyramid. Even before the Great Recession, between 2001 and 2006, more than half of the income gains in the United States were going to the top 1 percent of income earners, and around 20 percent to the top 0.1 percent.47 Under these circumstances, economic growth can slow down and yet the rich can get relatively (and absolutely) richer faster—precisely because the poor are getting relatively (and absolutely) poorer faster. The combination of stagnation, financialization, and austerity all work to reinforce the power and wealth of capital and to place workers in a weaker and more dependent position. The economy as a whole may not be doing well but the rich are seeing their income and wealth rise hand over fist. This situation—one in which the amassing of wealth at the top is no longer as directly dependent on the growth of capital accumulation/investment or of production (which increasingly take second place to financial speculation)—is bound to create ever larger contradictions in the system as a whole. This is related within the world economy to the relative shift in industrial production to the global South, with multinational corporations in the center gaining the lion’s share of the surplus generated through the global labor arbitrage, or the migration of production worldwide to regions with the lowest wages (and safety and environmental protection) costs—the highly exploited export zones in the global South. What should the response of the U.S. working class and the working class in the rest of the advanced capitalist world—not to mention the rapidly emerging working-class of the periphery—be in these circumstances? It hardly needs to be said. The only possible answer to capital’s unlimited decades-long assault on labor is to unleash a class struggle from below in response. But economic resistance alone is never sufficient; and all the less so in those cases where workers are economically hemmed in as at present. The “very necessity of general political action,” Marx wrote in Value, Price and Profit, “affords the proof that in its merely economic action capital is the stronger side.”48 The revolt of the underlying population therefore must take the form of a general political offensive against what is an unequal and irrational system. If the future of humanity and that of capitalism can be said to have coincided at one time, this is certainly no longer the case today. All reality and all hope demand a new system of production and consumption, beyond capital and beyond mere wage labor. ↩Max Weber, The Protestant Ethic and the Spirit of Capitalism (New York: Charles Scribners, 1958), 21, and Economy and Society (Berkeley: University of California Press, 1978), 85–86, 138, 1156. ↩Karl Marx, Capital , vol. 1 (London: Penguin, 1976), 781–802. ↩Marx, Capital , vol. 1, 796. ↩Broader conceptions of the reserve army would include most of those incarcerated and in the military since these soak up the surplus labor of society and show how far the society is from using the productive labor at its disposal. ↩Marx, Capital , vol. 1, 798; Harry Braverman, Labor and Monopoly Capital (New York: Monthly Review Press, 1998), 264–77. For a detailed empirical discussion of the modern reserve army of labor see Fred Magdoff and Harry Magdoff, “Disposable Workers: Today’s Reserve Army of Labor,” Monthly Review 55, no. 11 (April 2004). On the global aspects of the reserve army see John Bellamy Foster and Robert W. McChesney, The Endless Crisis (New York: Monthly Review Press, 2012), 125–54. For a recent dissertation on Marx’s reserve army and its significance for the sociology of unemployment see R. Jamil Jonna, “Toward a Political-Economic Sociology of Unemployment: Renewing the Classical Reserve Army Perspective,” PhD dissertation, University of Oregon, June 2013. ↩Calculated from St. Louis Federal Reserve FRED database, series PAYEMS, all nonfarm employees. ↩See David Milton, The Politics of U.S. Labor (New York: Monthly Review Press, 1982), 154–67. ↩Lewis Powell, “Memo to U.S. Chamber of Commerce,” August 23, 1971, http://reclaimdemocracy.org; Bill Moyers, “How Wall Street Occupied America,” Nation , November 21, 2011, http://thenation.com; Jacob S. Hacker and Paul Pierson, Winner-Take-All Politics (New York: Simon and Schuster, 2010), 117–20. ↩William E. Simon, A Time for Truth (New York: McGraw Hill, 1978), 195–201, 219–21, 230–38; Moyers, “How Wall Street Occupied America”; Hacker and Pierson, Winner-Take-All Politics , 123–24; W. Carl Biven, Jimmy Carter’s Economic Policy (Chapel Hill: University of North Carolina Press, 2002), 237–52. ↩Kris Maher, “House Bill Would Boost Federal Authority Over Workplace Safety,” Wall Street Journal , April 18, 2013, http://online.wsj.com. ↩Gordon Lafer, The Legislative Attack on American Wages and Labor Standards, 2011–2012 , Economic Policy Institute Briefing Paper #364, October 31, 2013, http://epi.org. ↩Ben Stein, “In Class Warfare, Guess Which Class Is Winning,” New York Times , November 26, 2006, http://nytimes.com. ↩See Doug Henwood and Liza Featherstone, “Marketizing Schools,” Monthly Review 65, no. 2 (June 2013): 58–70. ↩Paul Krugman, “A War on the Poor,” New York Times , October 31, 2013. ↩On the global labor arbitrage see Foster and McChesney, The Endless Crisis , 137–43. ↩Harry Magdoff, “A Letter to a Contributor: The Same Old State,” Monthly Review 49, no. 8 (January 1998); 1–10. ↩See Floyd Norris, “Many More Are Jobless Than Are Unemployed,” New York Times , April 12, 2008, http://nytimes.com. Related to the real jobless or non-employment rate is the employment-population ratio. See Paul Krugman, “The Employment Situation,” New York Times Opinion Pages , September 7, 2012, http://krugman.blogs.nytimes.com. ↩Philip Elliott, “Study: 15 percent of US Youth Out of School, Work,” Associated Press, October 21, 2013, http://bigstory.ap.org. ↩Annie Lowrey, “Caught in a Revolving Door of Unemployment,” New York Times , November 16, 2013, http://nytimes.com. ↩Heidi Shierholz, “A Projected 13.1 Percent of Workers Will Be Unemployed at Some Point in 2013,” Economic Policy Institute , December 19, 2012, http://epi.org. ↩Bruce Western, Jeffrey Kling, and David F. Weiman, “The Labor Market Consequences of Incarceration,” Crime & Delinquency 47, no. 3 (2001): 410–27; Bureau of Justice Statistics, “Prisoners in 2012,” http://bjs.gov; Hannah Holleman, Robert W. McChesney, John Bellamy Foster, and R. Jamil Jonna, “The Penal State in an Age of Crisis,” Monthly Review 61, no. 2 (June 2009): 1–17. ↩On this topic see Heidi Shierholz, “The Missing Workers: How Many Are There and Who Are They?,” Economic Policy Institute , April 30, 2013, http://epi.org. ↩Heidi Shierholz, “Roughly One in Five Hispanic and Black Workers are ‘Underemployed,’” Economic Policy Institute , August 22, 2013, http://epi.org. ↩Carol Hazard, “Hiring Explodes in Part-time and Contract Work,” Richmond Times-Dispatch , September 2, 2013, http://timesdispatch.com. ↩Michael Grabell, “The 4 A.M. Army,” Time , June 27, 2013, http://nation.time.com. ↩David J. Roelfs, Eran Shor, Karina W. Davidson, and Joseph E. Schwartz, “Losing Life and Livelihood: A Systematic Review and Meta-Analysis of Unemployment and All-Cause Mortality,” Social Science and Medicine 72, no. 6 (March 2011): 840–54, http://ncbi.nlm.nih.gov. ↩Kate W. Strully, “Job Loss and Health in the U.S. Labor Market,” Demography 46, no. 2 (May 2009): 221–46. ↩A. Lundin, I. Lundberg, L. Hallsten, J. Ottosson, and T. Hemmingsson, “Unemployment and mortality—a longitudinal prospective study on selection and causation in 49321 Swedish middle-aged men,” Journal of Epidemiology and Community Health 64 (2010): 22–28. ↩Marina Karanikolos, Philipa Mladovsky, Jonathan Cylus, Sarah Thomson, Sanjay Basu, David Stuckler, Johan P Mackenbach, and Martin McKee, “Financial Crisis, Austerity, and Health in Europe,” Lancet 381 (2013): 1323–31. ↩“Federal Minimum Wage Rates, 1955–2013,” http://infoplease.com. ↩Calculated from St. Louis Federal Reserve FRED database, Real Median Household Income in the United States (MEHOINUSA672N). ↩Sylvia Allegretto, Marc Doussard, Dave Graham-Squire, Ken Jacobs, Dan Thompson, and Jeremy Thompson, Fast Food, Poverty Wages: The Public Cost of Low-wage Jobs in the Fast-food Industry , University of California, Berkeley, Center for Labor Research and Education and the University of Illinois at Urbana-Champaign Department of Urban & Regional Planning, October 15, 2013, http://laborcenter.berkeley.edu. ↩Carl Bialik, “Public Cost of Fast-Food Industry’s Low Pay Remains Unclear,” Wall Street Journal , November 1, 2013, http://online.wsj.com. ↩David Ferguson, “Bernie Sanders: Walmart Family’s ‘Obscene’ Wealth Subsidized by Taxpayers,” Raw Story , August 3, 2013, http://rawstory.com. ↩ A Profile of the Working Poor , 2011 , U.S. Bureau of Labor Statistics Report 1041, April 2013, http://bls.gov. ↩ A Profile of the Working Poor , 2011 . ↩Edward P. Lazear, Kathryn L. Shaw, and Christopher Stanton, “Making Do With Less: Working Harder During Recession,” NBER Working Paper No. 19328, National Bureau of Economic Research, August 2013, http://nber.org; “Why Productivity Increased During the Downturn,” CNN Money , October 3, 2013, http://management.fortune.cnn.com/. ↩“Workers’ Awesome Output,” Washington Post , March 31, 2010, http://washingtonpost.com. ↩Fred Magdoff and John Bellamy Foster, “Class War and Labor’s Declining Share,” Monthly Review 64 no. 10 (March 2013): 1-11. It should be noted that our article contained a small error. In the comparison of private-sector employees and all employees in Charts 1 and 2 the difference between the two was incorrectly said to be government workers instead of government and non-profit workers. 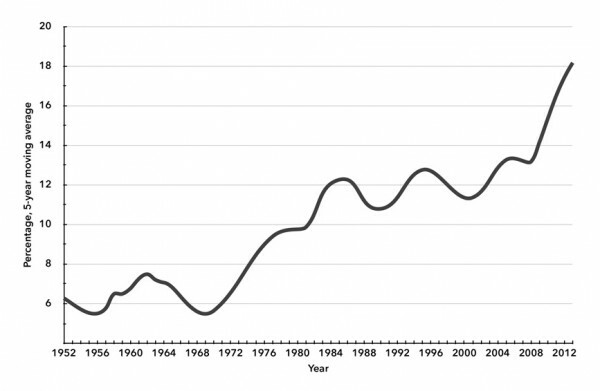 However, this did not materially affect the argument in any significant way, because the argument clearly was that the small decline in the wage share in the 1970s did not occur within the private/profit sector and was instead attributable to the growth of non-private/non-profit sector employment. ↩Margaret Jacobson and Filippo Occhino, “Labor’s Declining Share of Income and Rising Inequality,” Commentary, Federal Reserve Bank of Cleveland, 2012, http://clevelandfed.org; Michael W.L. Elsby, Bart Hobijn, and Aysegul Sahin, The Decline of the U.S. Labor Share , Federal Reserve Bank of San Francisco Working Paper 2013-27, 2013, http://frbsf.org; Congressional Budget Office, What Accounts for the Slow Growth of the Economy After the Recession? , 2012, http://cbo.gov, 14; Economic Report of the President , 2013, http://gpo.gov, 60–61. ↩Justin Lahart, “Worry Over Inequality Occupies Wall Street,” Wall Street Journal , November 10, 2013, http://online.wsj.com. ↩ The Decline of the U.S. Labor Share , 31. ↩Calculated from NIPA Tables 1.1.5. Gross Domestic Product and 6.19D. Corporate Profits After Tax by Industry, U.S. Department of Commerce, Bureau Economic Analysis, http://bea.gov. ↩Hacker and Pierson, Winner-Take-All Politics , 3. ↩Karl Marx, Value, Price and Profit (New York: International Publishers, 1935), 59.